What are the basic steps to use FreeFileSync? Where can I find information about FreeFileSync's advanced features? Which operating systems does FreeFileSync support? Are there limitations on the number of files to sync? Is FreeFileSync free for commercial use? May I distribute the FreeFileSync installation package? Do I need to uninstall FreeFileSync before installing a newer version? Should I use local or portable installation? Is FreeFileSync still showing an advertisement in its installer? What are the benefits of the FreeFileSync Donation Edition? How can I get the Donation Edition for multiple users? How can I install FreeFileSync silently via command line? My virus scanner/firewall shows a scary warning. How can I report bugs or suggest new features? FreeFileSync has crashed/is hanging! How can I help with trouble shooting? How can I record a trace file for troubleshooting file access errors? Why are network shares not found when synchronizing via Task Scheduler? Why does Windows Explorer show a different number of items? How can I fix the error "Cannot read/write permissions of <file path>"? Why are some files still different after synchronization? I have deleted files accidentally. How can I restore them? Choose left and right directories. Where can I find information about FreeFileSync's advanced features? For the most up to date description of FreeFileSync, visit the Online Manual. Press F1 while running FreeFileSync. If internet access is not available, an offline version of the manual can be found in the FreeFileSync installation folder. After you've become comfortable with using FreeFileSync, be sure to read chapter Tips and Tricks! Which operating systems does FreeFileSync support? FreeFileSync runs natively on all 32 and 64-bit Windows versions. FreeFileSync runs on all recent 64-bit editions of macOS. FreeFileSync is supported on all major Linux distributions. Are there limitations on the number of files to sync? FreeFileSync imposes no artificial limitations on how many files you can sync. Practically speaking, the only limiting factor for extremely large sync jobs is the amount of free memory available: For each 1 GB of RAM, FreeFileSync can synchronize roughly 1.7 million file pairs at a time. Is FreeFileSync free for commercial use? Yes, FreeFileSync may be used in business, commercial, and government environments without cost. The software must be distributed free of charge and without modification to the contents of the installer package. Redistributing the installer package with any files added, removed, or modified is prohibited. The inclusion of the installer package or any of the included files in a different archive, or in a different installer is forbidden. For example, the integration into a third-party automated installation mechanism is forbidden without the prior permission of the author. Do I need to uninstall FreeFileSync before installing a newer version? No, you can safely install a new version of FreeFileSync into a directory that contains an old version. FreeFileSync will recognize the previous installation and clean up thoroughly should you choose to uninstall at a later time. Should I use local or portable installation? FreeFileSync is designed for local installation and provides the best user experience in this variant. In order to support restricted scenarios, FreeFileSync also allows for portable installation on USB memory sticks or external hard drives. However, part of FreeFileSync's functionality may not be available in this case: For example, it won't be possible to manage FreeFileSync configuration files via context menu in Windows Explorer or start batch runs with a few mouse clicks. Therefore local installation is recommended in general. Is FreeFileSync still showing an advertisement in its installer? No, FreeFileSync is completely ad-free! 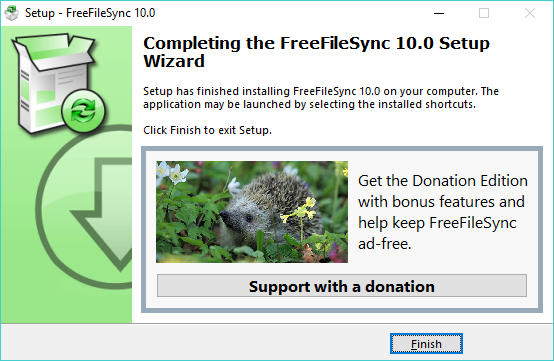 Before version 10, FreeFileSync had shown a single advertisement during installation to help fund the project. Beginning with FreeFileSync 10, the project is now fully relying on donations from users to finance its ongoing expenses in software development and support. Thanks to everyone who is contributing to make this possible! What are the benefits of the FreeFileSync Donation Edition? Everyone who donates is offered a special version of FreeFileSync without any advertisements, including a number of bonus features. The FreeFileSync Donation Edition is a thank-you for supporting the FreeFileSync project! After donating, you are automatically redirected to a page with the download link and a confirmation email is sent, too. Depending on the donation amount, the download page and auto-updater will remain active for a certain time to also download future updates of the FreeFileSync Donation Edition. Just like the standard edition, the FreeFileSync Donation Edition has an unlimited usage duration, even when the update period has expired. Donation amounts that are between or above the numbers shown in the table are calculated accordingly, e.g. a €15 donation corresponds to 8 months, a €100 donation to 5 years, etc. The FreeFileSync Donation Edition is expected to be used by a single user, but support for multiple users is available. It also includes command line parameters that help to integrate into systems for mass deployment. Note: Some anti-virus programs, most notably Norton by Symantec may falsely flag the installer as dangerous and delete it without providing further info. This is because Norton uses a so-called "reputation-based heuristic", which will simply delete all files that are not well known or commonly downloaded. This simple algorithm is expected to fail with the FreeFileSync Donation Edition which is not widely distributed by design. As a workaround, you can try to restore the deleted installer or use a smarter anti-virus program. How can I get the Donation Edition for multiple users? 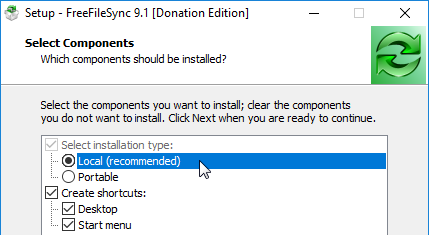 The FreeFileSync Donation Edition may be used and installed by a single user on their computer. This includes installation on portable storage devices (USB memory sticks) and even use on different computers, provided that FreeFileSync was already activated (during first start) on the former computer. However, if the portable installation files are copied to a different computer (instead of being used directly from a memory stick), this is considered to be a second installation. In order to obtain the FreeFileSync Donation Edition enabled for multiple users/installations, please use the donation button here on the side. Disables the update prompt when a new FreeFileSync version is available. Instead updates are expected to be installed by a deployment system. My virus scanner/firewall shows a scary warning. Is there a virus, malware, or trojan? No, the FreeFileSync installer never contains malware or viruses. Both firewalls and virus scanners work with heuristics in addition to searching for known virus patterns. Heuristics are generic algorithms that try to identify malicious behavior by evaluating certain program characteristics according to their proprietary implementation. Often, it is already sufficient to have a program access the internet to get this classification. By their very nature, heuristics cannot be exact and frequently lead to false-positive detections. Occasionally FreeFileSync is a victim of this. Trojan.Win32.Generic!BT, Heur.AdvML.B, WS.Reputation.1 or Artemis!24FFD34B2F78 are typical names used for AV heuristics. In any case, when in doubt never trust a single anti-virus software and use an online mass virus scanner for comparison. How can I report bugs or suggest new features? The best place to get in contact is via the FreeFileSync Forum. This allows for other FreeFileSync users to share their experience and give immediate feedback. A lot of problems have already been discussed and solved, so searching the forum may be the quickest way to get help. FreeFileSync has crashed/is hanging! How can I help with trouble shooting? Usually, FreeFileSync will generate a mini dump file automatically when it detects a program crash. This file can then be sent to the FreeFileSync development team for further analysis. Download the tool Process Explorer and reproduce the hang. Now start Process Explorer and right-click on FreeFileSync_x64.exe (or *_win32.exe if you're on 32-bit Windows), select Create Dump and then Create Full Dump. Next, compress this file with zip or rar and send it to the email shown in FreeFileSync's about dialog. If the attachment's size is too large for email, upload it to some free file hoster and send the link instead. Download Process Monitor and start it with filter settings reset to default. Now retry the operation with FreeFileSync that you want to trace, switch back to Process Monitor and save the trace as a PML file. You may compress this file with zip or rar and send it to the email shown in FreeFileSync's about dialog. Prerequisite: Start macOS Recovery (press and hold Command + Option + R during start up) and enter csrutil enable --without dtrace into the Terminal. Why are network shares not found when synchronizing via Task Scheduler? 1. Test access rights: Make sure the network share was set up correctly by testing access manually with Windows Explorer and FreeFileSync. 2. Check user account: Verify that Task Scheduler is using the same user account that you used during your manual testing. 3. 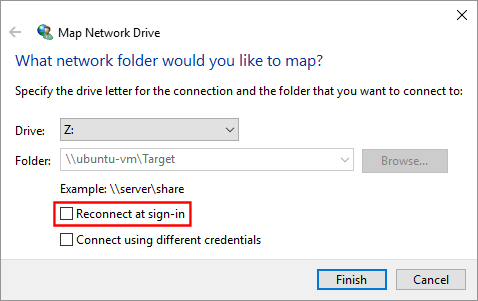 Use UNC syntax (\\server\share): If you have mapped a network share to a local drive letter, and have set up Windows Task Scheduler to use a different user account, FreeFileSync will not be able to see the network mapping. Access may fail even when the user account is the same, see the caveat below. Mapped network drives are tied to a specific user session and other user accounts do not have access. In fact they may have mapped the same drive letters to completely different network shares. For example, if you've created a non-persistent drive mapping ("Reconnect at sign-in" unchecked), the mapping will be visible only to the current user session and not to other sessions. Now if you have enabled "Run with highest privileges" in Task Scheduler, a new user session with elevated rights will be created. This session corresponds to the same user account, but it will not have access to the non-persistent drive mapping, because it's a different session after all. Had you used a persistent drive mapping instead or not run with highest privileges, this scenario would have worked. Why does Windows Explorer show a different number of items? When synchronizing with FreeFileSync and comparing the number of items of the source and target folders with Windows Explorer, consider the following possible explanations for a mismatch. If you still find yourself unable to explain the difference, drill down into specific folders with both applications until you find an actual file/folder that is handled differently. This should reveal what the problem is. Filter settings: FreeFileSync's default filter excludes a few items that are generally not relevant for synchronization, such as $Recycle.Bin, desktop.ini, and thumbs.db. You may clear the filter settings to get an accurate account on file stats. Symlink settings: By default FreeFileSync skips symbolic links. Ignored errors: Check if FreeFileSync reported errors during comparison. Long file paths: Unlike FreeFileSync, Windows Explorer is not able to handle file paths longer than 260 characters. Consequently, Explorer will not count files/folders with such long paths. Bugs: Windows Explorer sometimes gets its numbers mixed up. How can I fix the error "Cannot read/write permissions of <file path>"? Copying NTFS permissions is not needed in general and is best left disabled. Go to Menu → tools → options and ensure permission copying is unchecked. 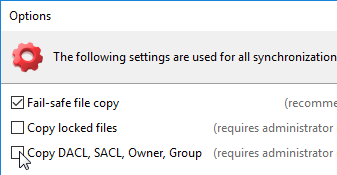 If you are an administrator and really need to preserve DACL, SACL, Owner and Group permissions, make sure the FreeFileSync process is running with admin rights. Why are some files still different after synchronization? Certain system software has the unfortunate habit of adding hidden alternate data streams (ADS) to newly created files. The files' modification times are then set to the current time as a consequence of this write access. Since this happens directly after FreeFileSync has copied the files, the next comparison will detect this modification just like any other external change. To resolve this problem you first need to identify which software is responsible for the file changes by using a tool like Process Monitor. Then see if the software has options to disable the unwanted behavior. If not, you can try to file a bug report on the software's support web site, or if nothing else helps, see if you can replace it with an alternative that does not underhandedly modify files. Certain anti-virus products modify newly created files, for example Comodo v8 (cmdagent.exe). To avoid this disable "File Source Tracking"
Microsoft Indexing Service (SearchProtocolHost.exe) is adding ADS streams to all .eml files after copy. This feature can be turned off with little loss. Permanent: You can try to recover them using a file un-deletion tool. Depending on whether the physical memory blocks on the hard drive have been overwritten in the meantime, it is possible to partially or even fully restore the files. 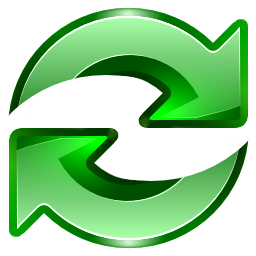 Recycle Bin: The deleted files are in the Recycle bin, unless they were flushed out by newer files that were moved to the bin later. Versioning: The deleted files are in the directory you have set up.